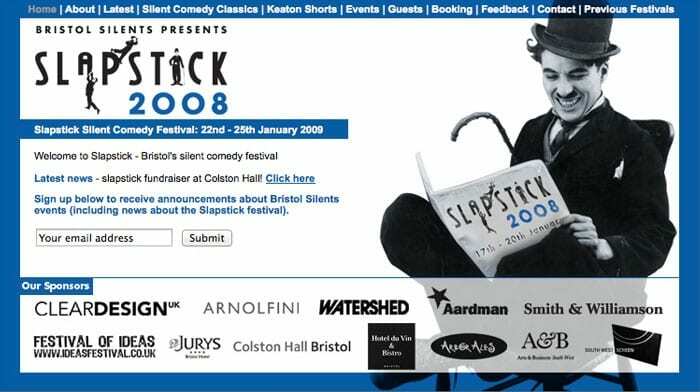 Slapstick 2008 - Slapstick | Bristol's Silent Comedy Festival. Taking place at Watershed, Colston Hall,Arnolfini and St George’s Bristol, Slapstick 2008 is bursting at the seams with remarkable film comedy and extraordinary talent. Paul Merton returns to host a very special Slapstick Gala event at Colston Hall, and other highlights include: special guests Peter Lord and Richard Williams hosting a celebration of pre-Mickey Mouse silent comedy animation; former Goodies Tim Brooke-Taylor and Graeme Garden hosting a celebration of the genius ofBuster Keaton at St George’s Bristol; and Neil Innes and Paul Merton championing French silent comedians including Max Linder and Jacques Tati. Many of the films will be brought to life by ‘the Doyen of silent film accompanists’ (BBC Radio 4), pianist extraordinaire, Neil Brand. & Bristol Silents members unless otherwise stated. Pass for all Watershed and Arnolfini events (except Cinékids) for £70.00 full/£52.00 concessions & Bristol Silents members.